It is estimated that more than 400,000 adults live in UK care homes, 80% of whom have dementia. More than half of older people in care homes have tooth decay compared with 40% of over 75s and 33% of over 85s who do not live in care homes. Care home residents are more likely to have fewer natural teeth, and those with teeth are less likely to have enough teeth to eat comfortably and socialise without embarrassment. 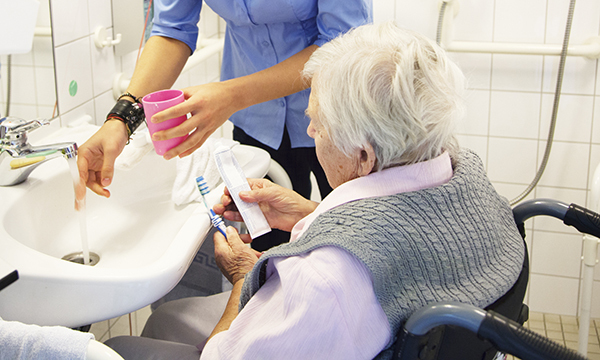 In July, the National Institute for Health and Care Excellence published guidance calling for oral health and access to dental treatments to be given the same priority as general health for all adults in care homes. The guideline includes recommendations on improving and maintaining residents’ day-to-day oral health care, ensuring staff are properly trained to look after the oral health needs of residents, and there is adequate access to dental services when needed. Oral health affects well-being and quality of life. Poor oral health can have an adverse effect on speech, taste, chewing ability, self-confidence and ability to socialise. It can also cause pain and discomfort. If the mouth is not adequately cleaned, gum inflammation and disease can cause bad breath, tooth loss, abscesses and pain. For residents with dementia, who may not be able to describe problems with their teeth or gums, poor oral health can result in untreated pain and infections that can worsen over time. Good quality information about oral health and dental needs in care homes is lacking. Many residents have complex oral health needs, but it is unclear how these are met. Practice varies across England. Poorly trained staff, lack of access to dental services and advice, existing oral health problems, medicines that decrease saliva, and treatments for chronic conditions including dementia make it difficult to identify and meet those needs. Each resident should have an oral health assessment when they enter a care home with the results, including any treatment needs, entered into their personal care plan. Staff should be trained to perform routine daily mouth care for those who may not be able to do this for themselves. This includes brushing natural teeth with fluoride toothpaste twice a day; daily oral care for full or partial dentures; and daily use of mouth care products prescribed by dental clinicians and any over-the counter products preferred by residents. ‘This guidance is about maintaining basic human dignity in those who may need help in looking after themselves. ‘Everyone should be able to speak, smile and eat comfortably, but all too often this is jeopardised by poor oral health which can have a significant negative effect on a person’s well-being and quality of life. ‘Poor or non-existent oral hygiene regimens can lead to gum disease and inflammation causing bad breath, tooth loss, abscesses and pain. ‘The daily routines recommended in the guidance will help prevent these problems and assist adults in care homes to have a comfortable, pain-free mouth. ‘Awareness of oral health needs to be raised within care homes and we want to see more staff given training about what they can do to help.